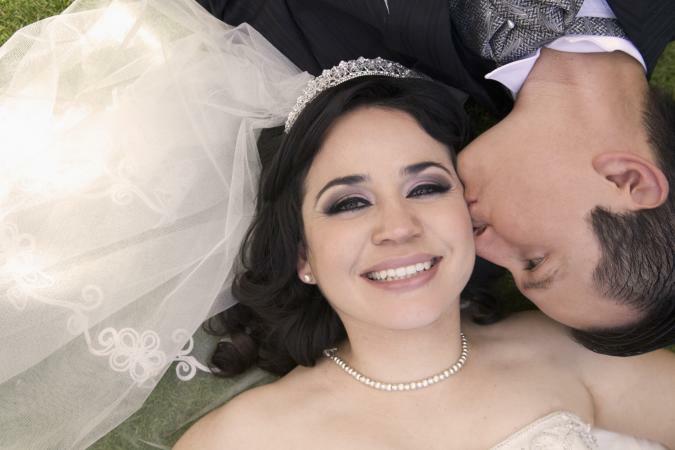 Mexican wedding traditions celebrate a couple's love, union, and cultural heritage. Adding any of these elements to your traditional Mexican wedding will add flair and act as a nod to your cultural background. According to The Yucatan Times, Mexican couples typically have padrinos or sponsors when marrying. Sponsors may be grandparents, parents, godparents, relatives, or friends. Becoming a couple's sponsor is both an honor and a responsibility. There are two types of sponsors. Sponsors that are chosen by the couple as mentors and role models, and sponsors that volunteer a gift to the couple. Mentor or role model sponsors are usually a successfully married couple. These sponsors are chosen as an exemplary model of what the couple hopes to become. They usually witness the religious ceremony and/or the civil registry of the couple. Role model type of sponsors are usually people greatly admired by the couple and the couple is honored to have them at the wedding. How many of these padrinos can a couple have? If the couple is getting married in the Catholic church, they might each select a couple. They may additionally chose another couple (and sometimes more than one) to witness the legal registry of the ceremony. This role is completely honorary, and it is more about social commitments and solidifying personal and professional connections. Sponsors that are contributing some aspect of the ceremony such as arras, lazos, flowers, and other items, may also be members of the wedding party. However, couples can have both wedding party and padrinos if they so wish. Weddings today are not quite the potluck of sorts they used to be, although they can be, especially with closely knit families and tight communities. Just like anywhere in the world, couples have discovered that whoever is paying for the wedding is the one who has a say. So many of the old sponsorships are not sought after anymore and these roles have become by far the honorary type. Special sponsors witnessing the ceremony or participating in some of the ceremony traditions are included in the program. When it comes to their attire, brides, grooms, and the bridal party have a lot of options. The bride's dress was traditionally sewn by her family members at the groom's family expense. Old fashioned dresses were heavily influenced by Spanish tradition and purported designs inspired in the Flamenco-type dress. Alternatively, indigineous brides would craft their dresses according to their local traditions and customs, many times incorporating imagery elements of good luck, fertility, and prosperity. In more recent times Mexican brides look to bridal magazines for inspiration and have their dresses tailor-made to their own body type and preferences from barely-there Monique Lhuillier inspired dresses to modern and contemporary Vera Wang type dresses. Of course, traditional fabrics and a rich inheritance of local design are still present at bridal shops adding a touch of tradition to modern styles. Even though not all Mexican brides get married in the church, many do, and in these cases church's dress code is to be followed. Because of this, brides may wear bolero jackets or shawls to cover their bare shoulders. Brides may chose to don a veil to cover her head as well, especially in a church setting. Mantilla wedding veils are the most reminiscent of old Spanish influence. Grooms traditionally wore a Mexican shirt and linen or black pants. Mexican wedding shirts are also known as a guayaberas and contain up to four small, patch pockets and two rows of vertical, fine pleats. These shirts are commonly made of linen and are of equal formality than any tux out there. In fact, Mexican presidents and other Latin American leaders have been known to sport guayaberas to international formal events. Although many a groom would rather wear a comfy guayabera than a stuffy suit, the truth of the matter is that many end up wearing a formal suit to their wedding. Suits are chosen in direct relation to the formality and time of the wedding. Many are rented and many more are tailored made for the groom. Traditionally, bridesmaids and groomsmen in a traditional Mexican wedding are paired together for the ceremony specially when they are to act as padrinos during the ceremony. As sponsors, these couples are assigned tasks to perform during the ceremony. The color of dress worn by bridesmaids and the cummerbund or tie worn by groomsmen typically match. Flower girls and ring bearers might be dressed to match the bride and groom or the bridesmaids and groomsmen. It is common to have the couple present the bridal bouquet to the Virgin Mary after the ceremony in hopes that she will bless the marriage. This tradition is deeply rooted in Mexico's devotion to the Virgin of Guadalupe. For this reason a secondary bouquet is prepared for the bride to carry after the ceremony, to pose with in photos, and later on to throw to the girls. The bride and groom typically kneel on pillows during the wedding mass. A sponsor may gift these pillows. They are placed on the kneelers. Rice, bird seeds, or white confetti is tossed at the couple as they exit the church. This symbolizes prosperity, fertility and good luck. Not entirely religious, but really traditional. Within the larger ceremony, there also occur several smaller ceremonies. These smaller ceremonies are usually included in the church ceremony, however their origin is completely non-religious so they can very well be used to personalize any kind of wedding ceremony. In Mexican wedding ceremonies both the bride and groom walk towards the altar accompanied by both parents. The groom walks in with mom and dad, and so does the bride. This tradition stems from the filial piety that is deeply seeded in Mexican culture. It serves to honor both parents and also as symbolism of the parents consenting to the union of their children. The origin of the lazos ceremony is actually a combination of two traditions. One predates the Spanish Conquista in Mexico and is very similar to the Hawaiian leis. Native Mexicans used (and still do) flowers collars to honor loved ones and to welcome special people into the community, their home, or their lives. Additionally, once upon a time, men and women used to meet at the plaza to consider potential mates, when the music started playing they would dance. If a lady though the gentleman she was dancing with was suitable, she would put her shawl around his shoulders showing everyone she had accepted him. This evolved into a public act where a couple that wanted to be together would stand before the town and cover both their shoulders with a shawl. This served to show everyone they were officially together, and if and when the civil registrar judge passed by the town (they used to travel periodically to record births, deaths, and marriages), then they would formalize things legally. The lazos (in plural because they are two individual necklaces united at the center) were not originally part of the Catholic ceremony, but couples were doing it anyway so the church decided to find a way to include it. They came up with a double rosary with a single cross that would essentially unite the couple in prayer and share the single leadership of Christ for their marriage. A double rosary with a single terminal. The rosaries can be simple or intricate with exquisite beadwork of all kinds. Silver and crystal rosaries are among the favorite ones. Two flower leis tied together in the middle by a bow. Fresh flowers are used to create a reinterpretation of the original flower necklaces and shawl traditions. A silk cord simply or intrinsically decorated with flowers and other adornments. Wishing for flowers leis that would last forever, crafty ladies create delightful flowers and adornments from fabric, beads, and even bread paste! 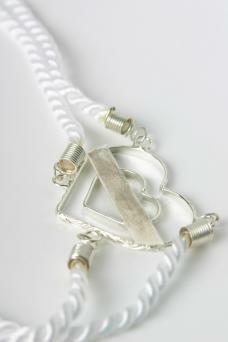 They are ideal for brides who are looking for a non-religious long lasting keepsake. During traditional Mexican weddings, the bride and groom are linked together with the lazos to symbolize the ties of love and trust joining them. The lazos are placed on bride and groom by the padrinos de lazos just like Hawaiian leis would be placed: over their heads as necklaces, leaving them to rest on the couple's shoulders. The placement occurs during a special wedding prayer before or after the bride and groom have exchanged vows. The couple wears the lazos throughout the remainder of the ceremony. The couple may keep them as a keepsake. Another tradition that predates the Spanish Conquista, the arras are a representation of what used to be a year's worth of wealth. Each year has 13 moons, for each moon the couple was given enough to live off, a honey moon of sorts that lasted all year. This was done in order to ensure the couple would have enough to bear their first offspring and get the family going. 13 valuable goods were given, usually cocoa beans or jade or some other item of value that could be easily stored and kept safe. With time this became a symbolic tradition that represents a wish of prosperity and abundance for the newly weds. Just like with the lazos, couples insisted on carrying out this tradition even when they were getting married by the church. Therefore, the Catholic church decided to include this tradition by assigning the coins a meaning more adequate to the values of the church. The coins came to symbolize the groom's commitment to supporting the bride and also represent Christ and his apostles. The bride's acceptance of the arras represents her unconditional confidence and trust in the groom and her vows to be a good administrator of the family's wealth. 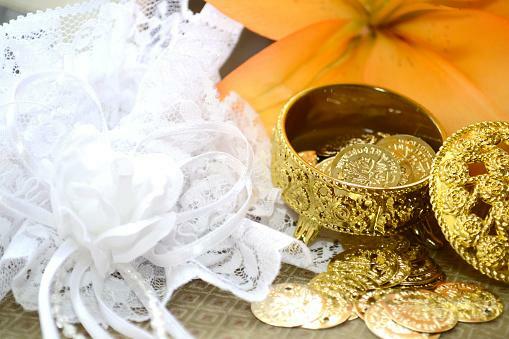 During the ceremony, the officiant blesses these golden coins and the groom gifts them to the bride. The arras may be a gift from the padrinos de arras and may be presented in an ornate box. After the wedding, they become a family heirloom. The couple exchanges rings during the ceremony. The rings are carried the padrinos de anillos and ring bearers if there are any, are actually only carrying mock rings. The ring sponsors may or may not really be sponsoring the rings but, just like the best man and the maid of honor in the U.S., they are being honored with this privilege. Traditions during Mexican weddings don't end with the ceremony. 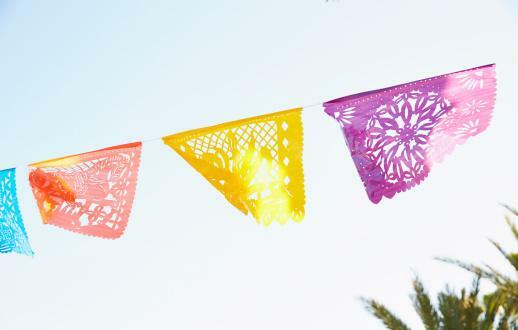 In fact, some Mexican wedding celebrations can last up to two days. This includes the actual wedding celebration and the tornaboda which is very similar to the day after brunch in the U.S. Sometimes it's just some late night snacks after the wedding, sometimes its a formal brunch, and many times couples just skip it, essentially having a one day wedding. A long time ago in small towns and tight knitted communities it was assumed that everyone was invited to the wedding. Of course this was also when weddings were sort of a big potluck and from where the sponsors tradition was born. Nowadays, painstaking care goes into carefully crafting the wedding guest list and designing the invites. While it's true that if budget and social relations permit a lot of people may get invited,it is not longer a celebration at large de facto. Seating has evolved from very old fashioned boys on side and girls on the other, to a table of honor for bride and groom under maybe a big arch of flowers or balloons, to a more contemporary set up like you would see in any modern wedding. During the reception the guests on the dance floor surround the bride and groom as they enjoy their first dance. The couple then dances with their parents and then with important padrinos and family members. Afterwards the dance floor is open to all! In this tradition male guests "pay" to dance with the bride, and female guests "pay" to dance with the groom. In reality it is just an excuse to gift money, the preferred gift by all, to bride and agroom. Usually a bill is pinned to the bride's dress or groom's suit and then the well wisher extends his/her wishes for a prosperous marriage to them as they dance. Given money is expected to be used by the newlyweds for their honeymoon or to set up their home. While DJs and bands are common staples at a Mexican wedding. Many many celebrations still enjoy a good old Mariachi serenade. During cocktail hour, after dinner, or intercalated with the band or DJ services, a good Mariachi band brings a touch of folklore and tradition to many Mexican weddings. In olden times the entire town would assist in preparing foods for the reception, and of course, all would attend. Delicious Mexican dishes were prepared in honor of the couple. Sometimes a goat or pig would be killed and expertly prepared for the occasion. Delicious side dishes and treats would be prepared to accompany the main feature. A lot of love, time, and effort went into creating these meals. Huge barrels of aguafresca [non-alcoholic flavored water drinks] may be offered. Some of the traditional flavors include horchata [rice and cinnamon], jamaica [hibiscus water], orange and lime, tamarind, and fruit punch. Beer buckets filled with ice to the brim. Good tequila served by placing a bottle per table. Margaritas and other Mexican and Latin American inspired mixed drinks. The traditional Mexican wedding cake used to be tres leches [three milks cake]. The soft, moist, melt in your mouth texture of milk infused cake does not allow for a tall stacked cake. This gave way to elaborate displays with several cake stands and cake fountains that were as magnificent as delicious. Nowadays many flavours, cake consistencies, and designs are in fashion, but the cake is still set up in a special place with all the grandeur it always had. As if the cake was not enough, many Mexican weddings offer dessert tables with a host of candies and treats. Cookies called polvorones [powdery crumbles] made with lots of pecans and butter and powdered with confectioner's sugar offer a taste of crumbly heaven. 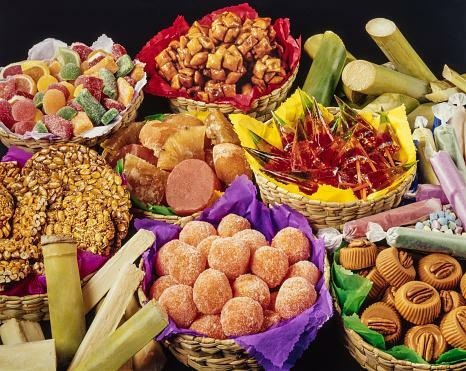 Traditional candies such as alegrías [joys] made from amaranth and molasses, cocadas or coconut cadies, artisan chocolate made by grinding roasted cacao beans with cinnamon and brown sugar with a mortar and pestle, and dulces de leche made with caramelized sweet milk may be offered. 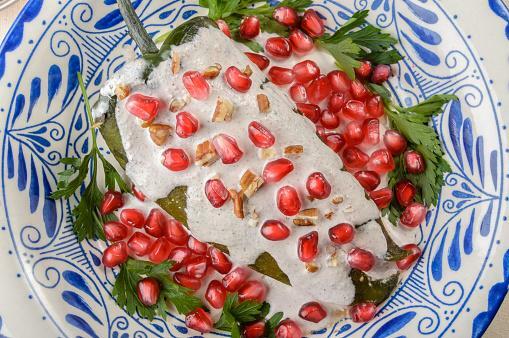 You can offer these traditional delights or a host of Mexican candies on a dessert table, or perhaps prepare some traditional bolos for guests to take away. Wedding favors are a big part of any Mexican wedding. Traditionally, favors are elaborated by the bride and her family. Busier families have them made at the local mercería [arts and crafts store]. They are to reflect the theme the bride has chosen for the wedding both in design and color, and are often offered in two installments: at the ceremony and at the reception. Rice for the ceremony: A small bundle of rice is prepared by wrapping rice in delicate tulle. The bundle is intricately decorated and the names of bride and groom plus the date are added in a paper or fabric ribbon. These are passed on to the guests right before the ceremony ends. These bundles serve two purposes: the first one is to facilitate the throw the rice over bride and groom tradition, the second one is to thank guests for attending the ceremony. Not all guests attending the ceremony will attend the reception, so this serves as a favor for them. Mementos for the reception: Before wedding favor catalogues and utilitarian favors made in China were readily available, brides would handcraft a little wedding favor to thank guests for attending the wedding. This handcrafted favor would be mainly of decorative value and designed in the motif and colors chosen for the wedding. Mementos would include the names of the couple and the wedding date. Guests would receive this favor and place it in a shelf somewhere as a reminder of the wedding. The statutory time of holding on to these mementos has never been too clear, so as you can imagine many a guest ended up with shelf filled with mementos. This is probably why edible wedding favors (think almonds wrapped in tule and bridal cookies in a cellophane bag) are way more popular and appreciated. Of course if you are thinking about edible wedding favors why not go all out and offer bolos. A staple in Mexican children's party celebrations, bolos are essentially baggies filled with treats and goodies. About two handfuls of decadent treats (such as popular candy and chocolates) are stuffed in these bags. Usually the bag is in the theme of the celebration and can be as elegant or as carefree as you want them to be. Although much more common to be found in children's parties (and quite honestly THE highlight) bolos can be included in any wedding celebration... but only if you want to drive your Mexican guests wild with excitement and bring back the fond memories of eating candy for the sheer joy of it! Whether you would like to throw a fully traditional Mexican wedding or just seek to incorporate elements of one into your celebration, there are plenty of traditions to choose from. 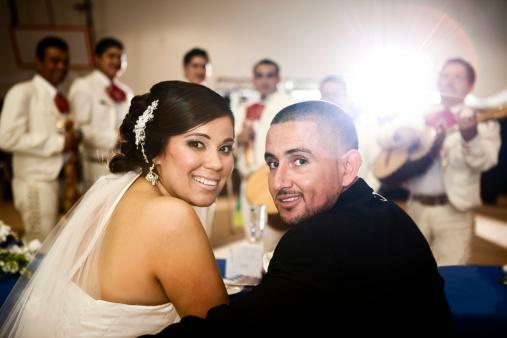 When planning your wedding, select those Mexican wedding traditions that you find fun and meaningful.